Meryl Streep, Michelle Williams, Emma Watson and Amy Poehler were among eight actresses bringing gender and racial justice activists as their guests to Sunday's Golden Globe Awards in an effort to shift the focus back on survivors and solutions, and away from those accused of sexual misconduct. "I think that people are aware now of a power imbalance and it's something that leads to abuse," Streep told E! News. "It's led to abuse in our own industry, and it's led to abuse across domestic workers' field of work. It's in the military, it's in Congress, it's everywhere. And we want to fix that. And we feel sort of emboldened in this particular moment to stand together in a thick black line dividing then from now." 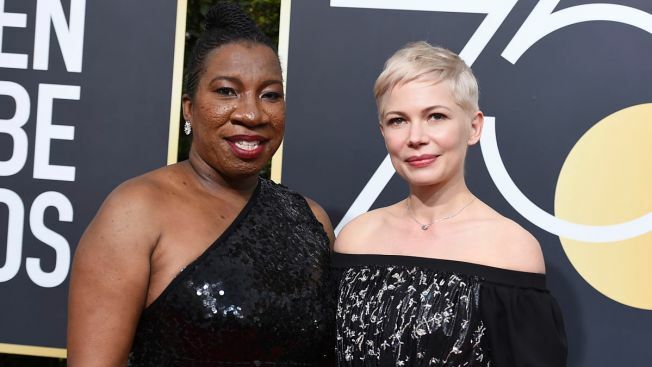 Williams brought Tarana Burke, the founder of the "me too" movement, and Watson brought Marai Larasi, the executive director of Imkaan, a black feminist organization. "You know why we're here? We're here because of Tarana," Williams told Ryan Seacrest on the carpet. "We're here because Tarana started a movement and she planted a seed years ago and it's grown and caught fire. She started the #MeToo movement." Poehler's guest was Saru Jayaraman, president of Restaurant Opportunities Centers, Shailene Woodley was being accompanied by Suquamish Tribe member Calina Lawrence, and Laura Dern walked alongside Monica Ramirez, a supporter of worker-led movements. Susan Sarandon brought Rosa Clemente, a political commentator. Nominee Emma Stone took tennis champ and advocate Billie Jean King, whom the actress portrayed in the film "Battle of the Sexes." Dern said she had reached out to Ramirez "to say that she stood with all the 700,000 women farm workers in solidarity for the women in our industry who were brave enough to speak out about sexual harassment and assault." Ramirez said that farmworker women "pick, pack and plant the food that we eat and have a long history of combating workplace sexual violence. When we learned about what was happening in Hollywood, our members felt very strongly that they wanted to send a message to the women in this industry and all women who are experiencing sexual violence in the workplace that they are not alone." In a statement Sunday, the advocates said they were inspired by the Time's Up initiative, which launched Monday with the backing of hundreds of Hollywood women, like Streep, Reese Witherspoon and Shonda Rhimes. The initiative vowed support for women in the entertainment business and beyond, from janitors to health care workers. "Each of us will be highlighting legislative, community-level and interpersonal solutions that contribute to ending violence against women in all our communities," the advocates' statement said Sunday. "It is our hope that in doing so, we will also help to broaden conversations about the connection to power, privilege and other systemic inequalities." The statement says that women of color should be at the center of the solutions. "We want to encourage all women — from those who live in the shadows to those who live in the spotlight, from all walks of life, and across generations — to continue to step forward and know that they will be supported when they do," the statement continued. 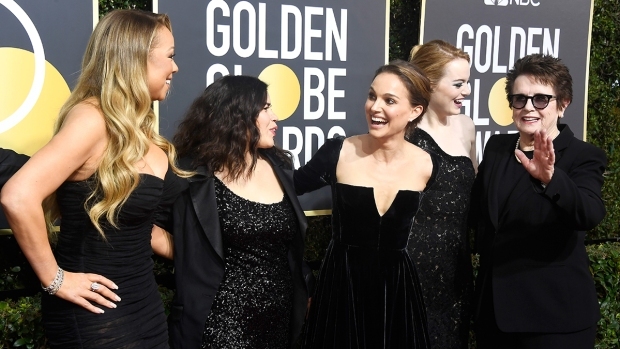 Many attending the Golden Globes were wearing black to protest sexual harassment. Mark Ruffalo tweeted Sunday that he wore black "in solidarity with the men and women asking for respect and equality."